There's no ambiguity about what this sign in Romford Road, E12 is advertising! It's less visually appealing than the Bovril advertisement in Chester, but was perhaps all the more effective for its boldness and simplicity. Wells in Somerset takes its name, perhaps unimaginatively, from the wells which provided it with fresh water. 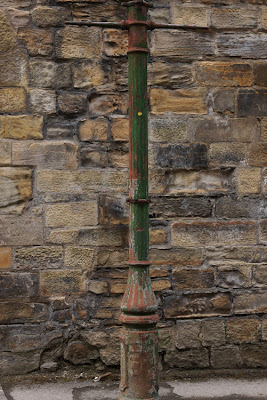 Two could be found in the grounds of the Cathedral and Bishop's Palace; the nearby market place provides a slightly more prosaic location for this conduit, which brought well water to the townspeople. Fresh drinking water has been available here since the middle ages. The current fountain is a relative youngster, built in the late eighteenth century. 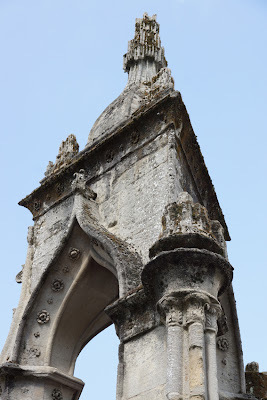 Its predecessor had been constructed in 1451, paid for by Bishop Beckington; unsurprisingly, it became somewhat dilapidated over the centuries and had to be pulled down in 1756. On Wednesdays and Saturdays, the fountain is surrounded by a market of equally venerable pedigree. Behind them, past the Penniless Porch, the cathedral overlooks the tiny city centre. Its beauties are - deservedly - more universally admired. Click the image to view more photographs. Back when our streets were lit by gas lamps, we hadn't yet discovered the benefits of natural gas. As a result, most used 'town gas' manufactured from coal. Given the trouble and expense involved, wouldn't it be better to find a more convenient, cheap source of gas power? Say, the very gas which was being vented unused into the air from sewer stink pipes? One Joseph Edmund Webb certainly thought so, and he tapped into this copious source of gas. However, the light was almost a side-effect: most importantly, the burning of gases helped avoid dangerous accumulations which might otherwise poison sewer workers or cause explosions. (Stinkpipes served a similar purpose, but couldn't always be tall enough to rise above buildings and only dispersed, rather than eliminated, the smells.) His creation, the Webb Patent Sewer Gas Destructor Lamp, had a great deal of success and the most famous example is in Carting Lane, London. 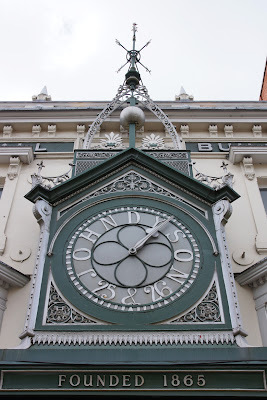 It still operates today - although it had to be restored after being hit by a lorry. However, Webb's product lined streets far beyond the capital. 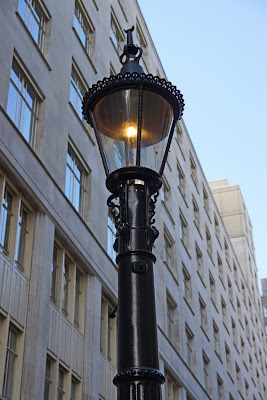 The first lamp was in his home town of Birmingham, erected in 1894; Sutton Coldfield quickly adopted the product; and soon the lamps could be found all over the country. Sheffield had a large number of them (some of which are still in place) while Whitley Bay and Monkseaton have ten of their original seventeen. I came across another example in Durham. It no longer operates, having apparently been extinguished during the wartime blackout, but still stands as if ready for use. 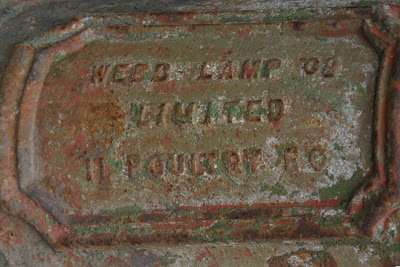 Indeed, such was the success of Webb's lamps that the Birmingham inventor was able to open offices at Poultry, City of London. The lamps did also require a more conventional gas supply, which burned in a cluster of three mantels to create intense heat. The resulting updraught helped draw out the methane which would then combust to produce a brighter light. 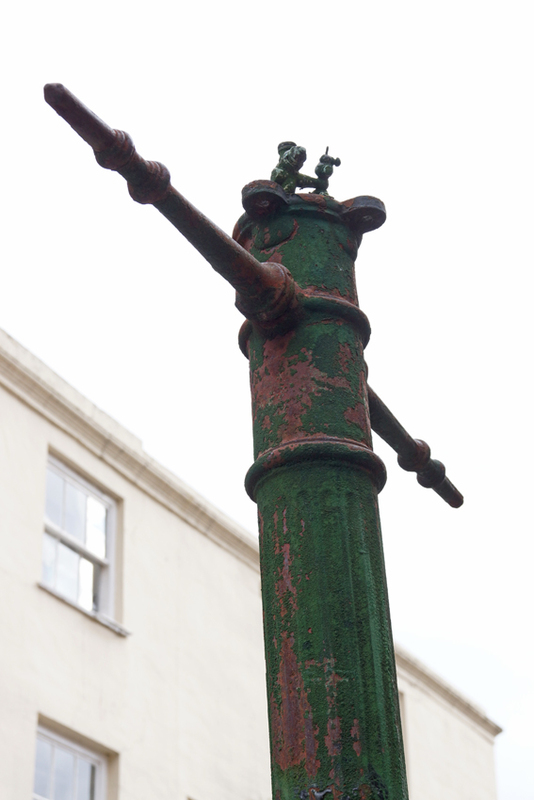 Because the lamps were always burning, there was no need for a lamplighter to do his regular rounds - but they still have the usual ladder bars, to facilitate cleaning and maintenance. 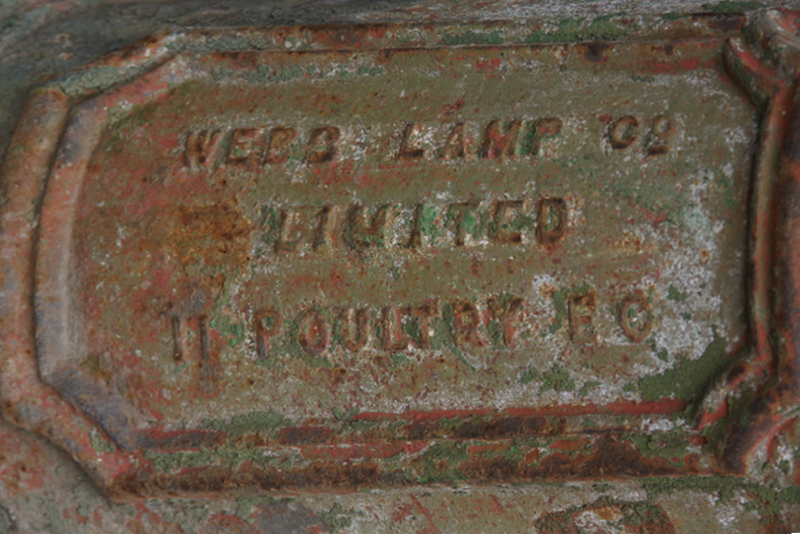 Further reading: Nik Morton's excellent article on Webb's lamps. 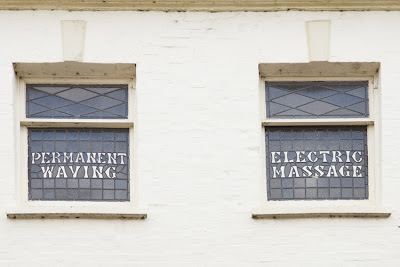 Above an estate agent's in Wells, Somerset, stained-glass windows advertise a former business. It offered quite a variety of services for appearance-conscious women, including 'modes' and 'robes' for the fashionably-dressed. 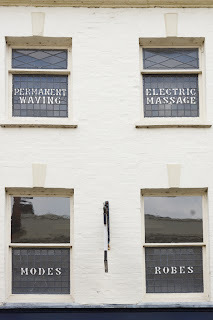 And for those concerned about their coiffeurs, 'permanent waving' and 'electric massage' were on offer. 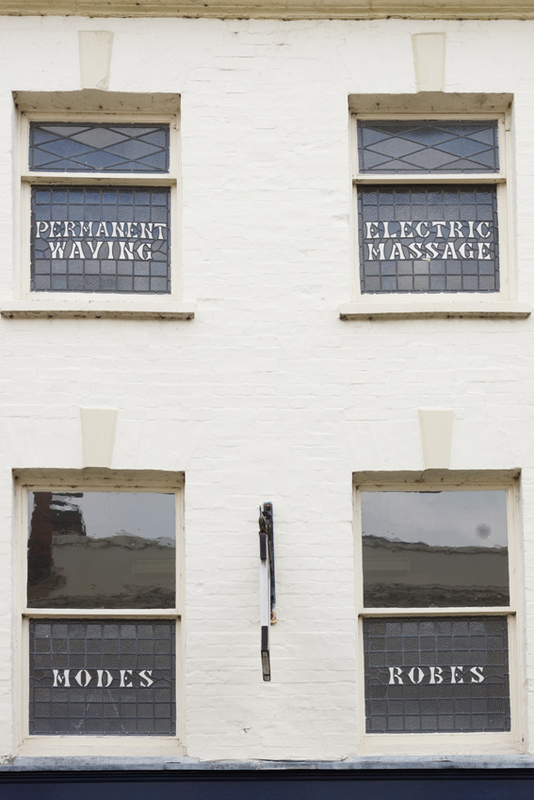 Permanent waving has been with us so long that many people have probably forgotten it's the correct name for the familiar 'perm'. 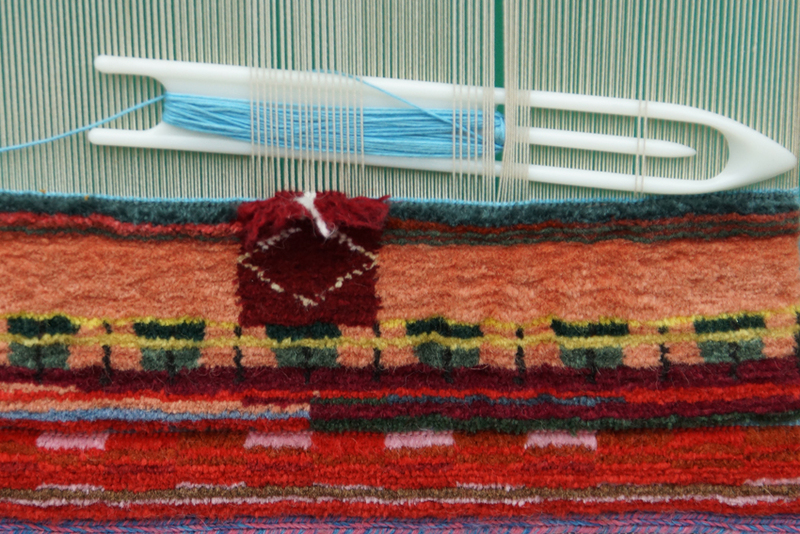 The process, first invented in the late nineteenth century, developed steadily through the 1920s and was commonplace in the 1930s. Only after the Second World War would home perms become an alternative to visiting the salon. 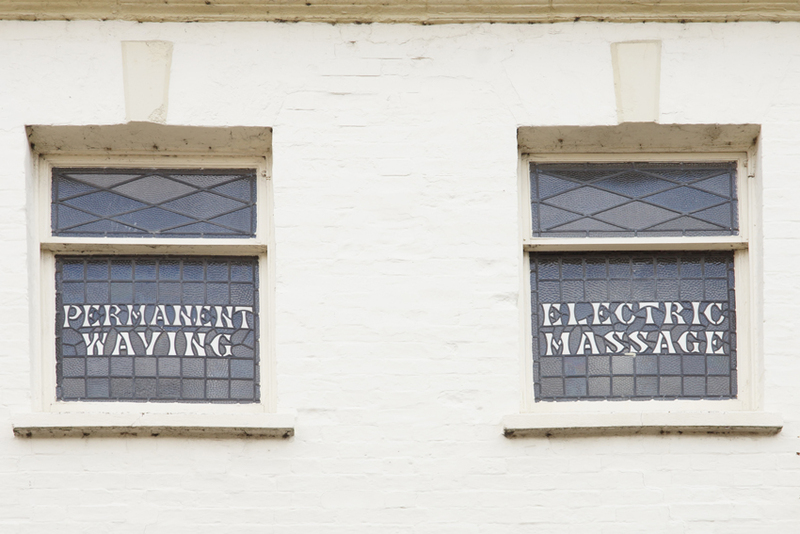 'Electric massage' may seem a more surprising hairdressing treatment. Today, it sounds odd and uncomfortable but in the first part of the twentieth century, electricity was seen as a source of health. An advertisement from 1931 offers electric massage using the Vytalife Electric Comb: it would cure headaches, dandruff, and baldness as well as giving the user wavy hair! One suspects that the women of Wells did not experience similar miracles. This sign is so perfectly in tune with current vintage fashions that it's hard to guess its age. 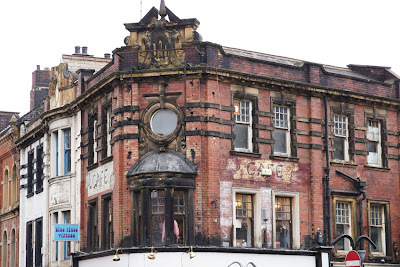 However, Lil's Cafe seems to have been gone for some years from this building next to the Corn Exchange. 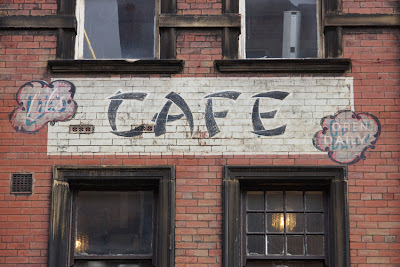 Before closing, it had been around long enough for the sign to be repainted at least once: under the black scrolls and white lettering of 'Lil's' and 'open daily' can be seen an earlier version with red flourishes surrounding a dark script. None of this brings us close to the actual age of the sign - if anyone knows, I'd love to hear from you! 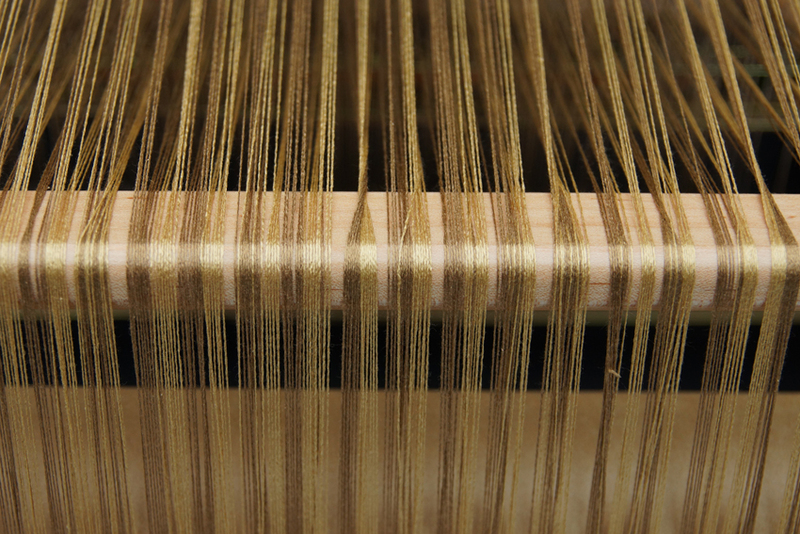 When the Huguenots - French protestants - fled persecution and moved to London, many of them brought skills as silkweavers. 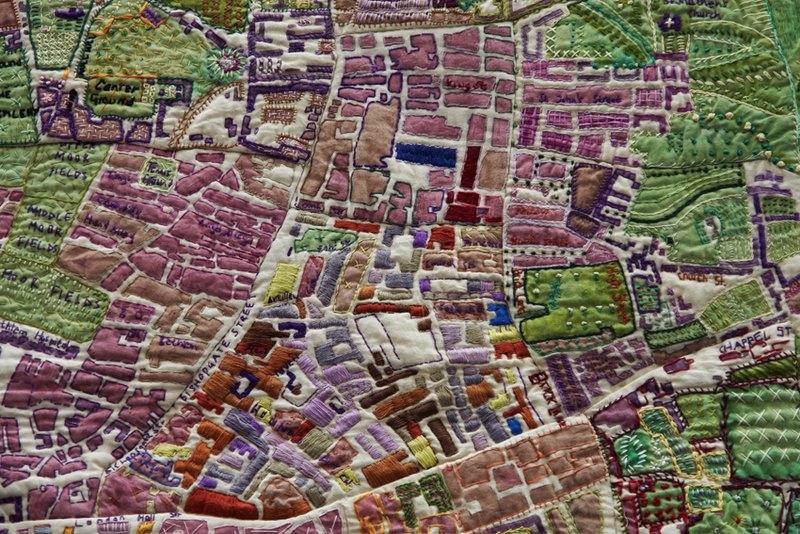 They settled in Spitalfields, away from the City and its guilds, and left lasting marks including the area's distinctive silkweavers' houses. Although mainly Calvinist, they even had some responsibility for Christ Church - built not by them but to remind them of the primacy of the Established Church. All of this history is being celebrated by the Huguenot Festival, now underway and running until 21 April. 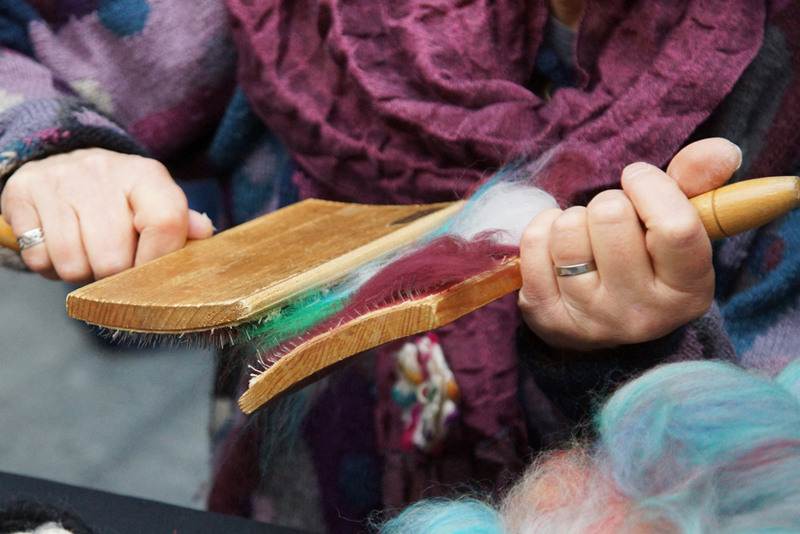 Yesterday, the Big Weave event at Spitalfields Market celebrated the Huguenots' association with the weaving industry. 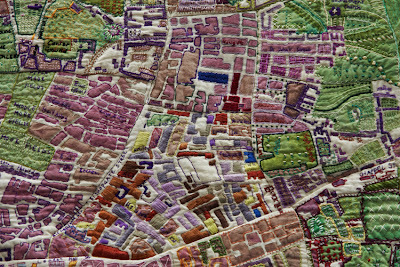 It included demonstrations of all sorts of weaving, and a textile version of the famous Roque Map of London - the detail below is of the Spitalfields area. 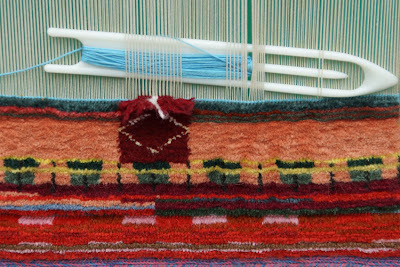 Forthcoming events include daily walking tours, talks, visits, and an exhibition at the Bank of England Museum. (Its first director was a Huguenot.) 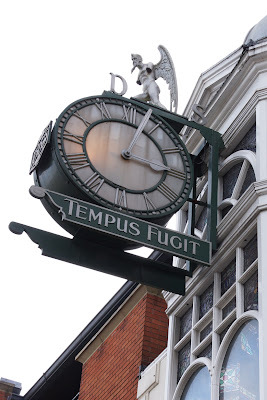 Full details, along with lots of suggestions for places to visit, are on the Huguenot Festival website. Travelling on the 123 bus through New Eltham, I saw a ghost sign which had been painted over. 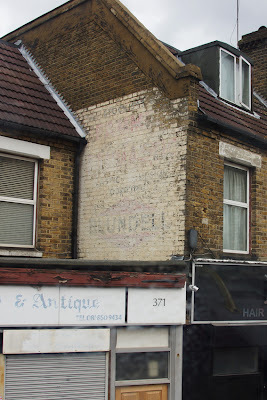 That the cream covering hadn't proved stronger or more durable is perhaps ironic, as it was attempting to obscure an advertisement for a brand of paint. 'Blundell' was actually Blundell, Spence & Co, founded as a partnership in 1811. 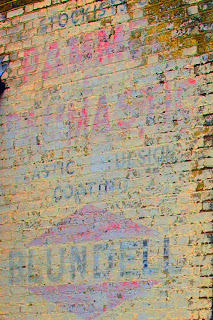 They manufactured paint in Hull - a centre of the paint industry then, as white lead was produced there - and by the twentieth century were exporting their products around the world. 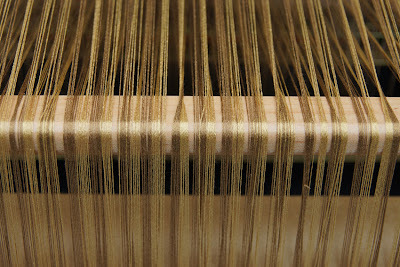 Subsidiaries were established in India, Chile, South Africa and Australia. The company would merge with Permoglaze in 1960, although the Blundell Spence name remained in use for another five years. Pammastic was a well-known brand name of the 1950s. 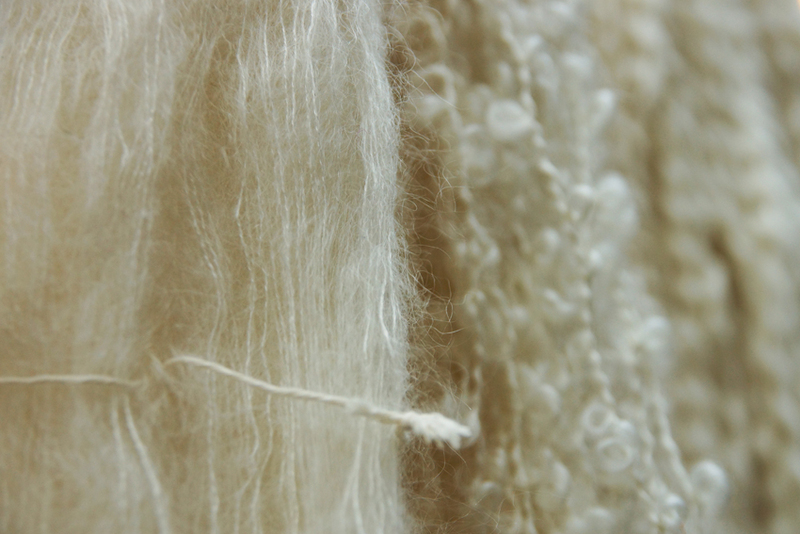 It was a polyvinyl acetate ('plastic') emulsion which didn't need undercoat and dried quickly. 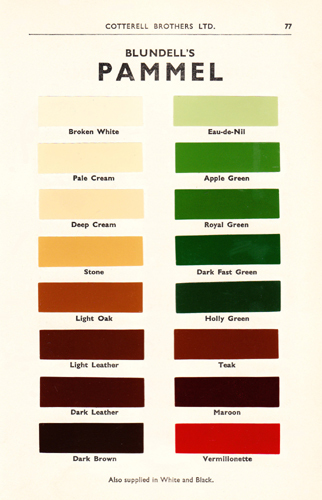 Its sister product Pammel offered a gloss 'enamel' finish in a range of colours. Temple, the area south of Strand largely occupied by barristers' chambers, has been home to two Inns of Court - Inner and Middle Temple - since the middle ages. Much of the building now there is considerably less ancient than that might suggest, as large parts of it had to be reconstructed after the Blitz; this was mostly done in eighteenth-century style, so the difference between old and new buildings is not obvious. Among the major buildings to be destroyed and rebuilt were Inner Temple Hall and Library, and part of Temple Church. The Elizabethan Middle Temple Hall also suffered damage. However, there had also been major rebuilding in the nineteenth century. By the 1830s, much of Temple was rather ramshackle, so new buildings brought modern comforts to the barristers who then often resided as well as worked there. A rather exuberant acknowledgement of one of these projects can be spotted on Middle Temple Lane. 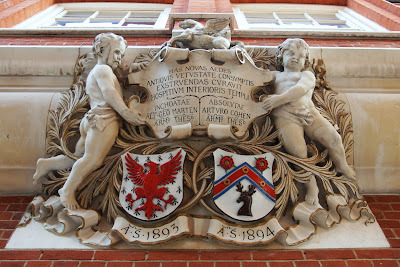 This fine sculpted plaque commemorates the rebuilding of the west side of Hare Court in 1893-4, work begun by Inner Temple Treasurer Alfred Marten and finished by his successor Arthur Cohen. Cohen's route to the Bar had not been as straightforward as it should have been: the Oxford Dictionary of National Biography describes a difficult path through university. A gifted student from a prominent family (his mother was a Montefiore with connections to the Mocatta family), Cohen wished to study at Cambridge but was rejected by several colleges because he was Jewish. In 1849, Magdalene College accepted him as a mathematics student - but only after he had passed an entrance exam on William Paley's View of the Evidences of Christianity. 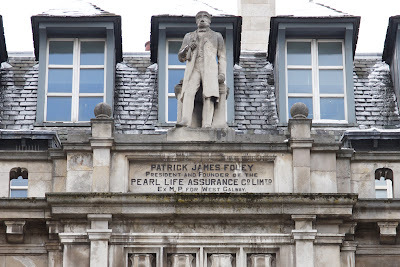 Once at the University, he succeeded academically as well as rowing for his college, and was President of the Union Society, but he could not be awarded his degree as a Christian oath was compulsory. That only changed thanks to the Cambridge Reform Act 1856, after which he became the first professing Jew to graduate from the University. A very successful legal career followed, and he was known for his kindness as well as his legal expertise. 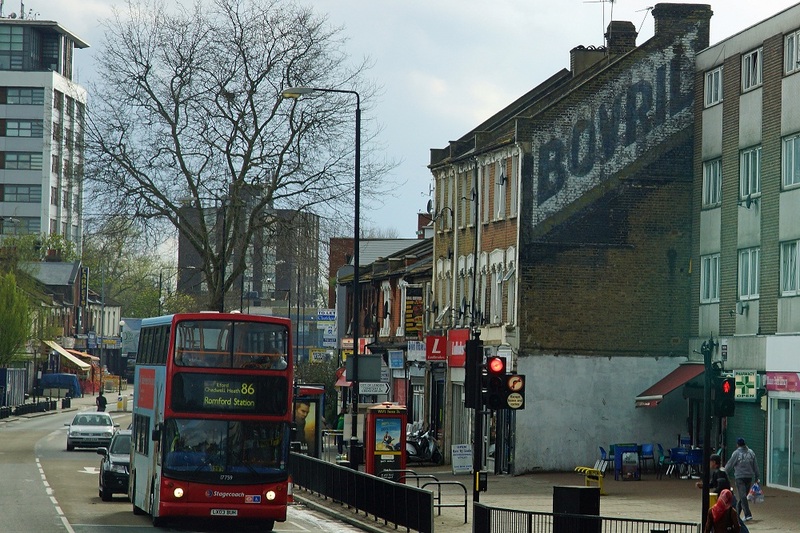 He was also the Liberal MP for Southwark in the 1880s, supporting Home Rule and opposing the hereditary House of Lords. Dinard, on Brittany's Emerald Coast, has long attracted summer visitors: the British have been holidaying here for a century and a half. The first hotel was built in 1859; others, and fine villas, would follow in subsequent decades. The often aristocratic visitors could enjoy not only the sea but also tennis, golf and above all, a fine social life: this was for a while France's premier seaside resort. However, as the area's climate is not dissimilar to that of southern Britain, the beach alone was not enough to entertain visitors. Thus the town boasted attractions including a casino and elegant shops.While the casino had been established as long ago as 1866, it was rebuilt at the beginning of the twentieth century, along with various new and stylish stores. While the town continues to be a popular and attractive resort, most of the original occupants of these stores built at the turn of the twentieth century have gone. However, their presence is still apparent in various forms. 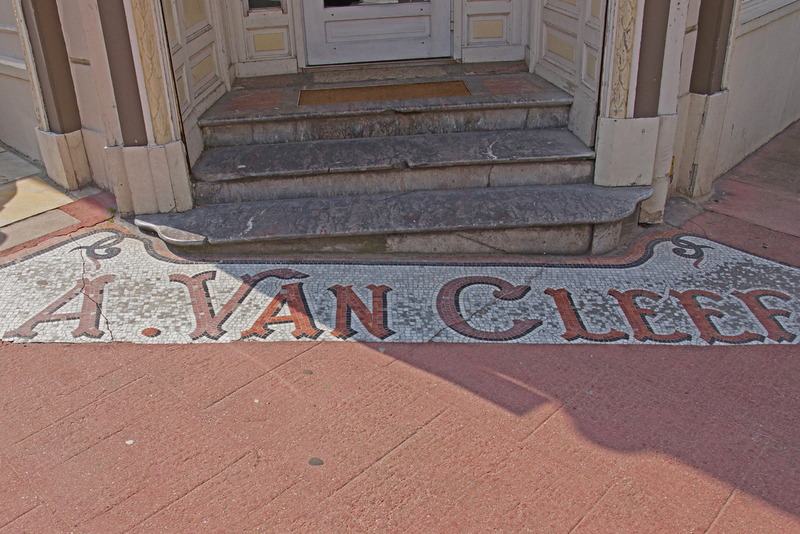 Opposite the casino is a reminder of a luxury jewellery store: A Van Cleef, who advertised with this fine pavement mosaic below the steps to their door. 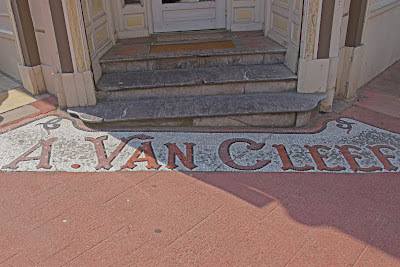 Although the full name is not given, this was in fact the first Van Cleef & Arpels branch outside their famous store in the Place Vendome, Paris. It opened in 1909; the 'A' was for Alfred Van Cleef, who masterminded this expansion. He would soon open further branches in Nice, Vichy and Deauville. Dinard fell out of fashion among the very wealthy thanks to the growing appeal of the sunnier Cote d'Azur, but continues to be a thriving resort. Many of its villas are listed, and they contribute to the town's unique atmosphere. Also fascinating, though, are these smaller traces of its past. Leeds grew enormously in the nineteenth century, so it's no surprise that much of its architecture - civic, commercial and industrial - should be Victorian and Edwardian. The city is full of wonderful examples in a range of styles and materials. Part of the particular appeal of this period is the abundance of quirky features often found in its buildings. While the popular image of the Victorians and Edwardians is rather stiff-upper-lip, etiquette-bound and respectable, their buildings can show a rather different personality. My first choice is an example both of the pride so many took in their achievements, and of the way that first impressions can mislead. 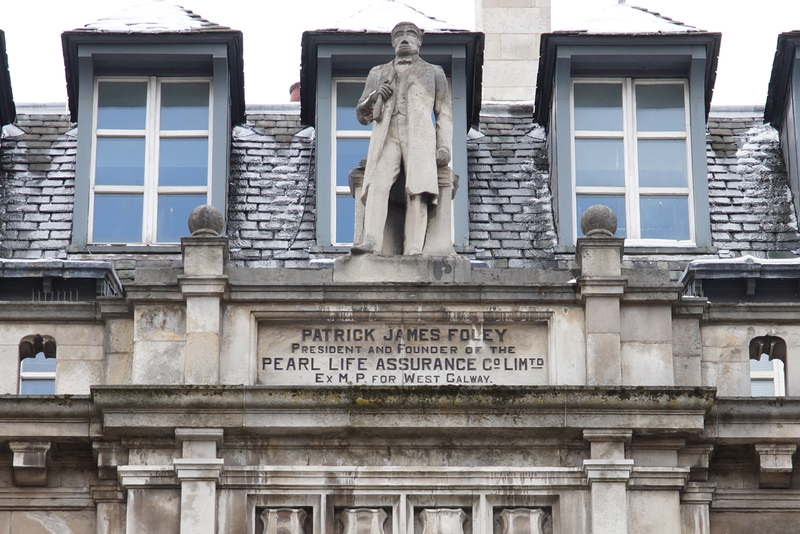 The Pearl Assurance building, opposite Leeds Town Hall, is topped with a statue of its founder. There was certainly no false modesty in putting his effigy directly opposite that grand monument to civic pride! 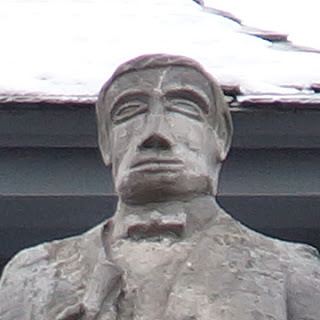 Telephoto lenses, however, reveal that the company was as canny as it was cocky: just look at the facial features. 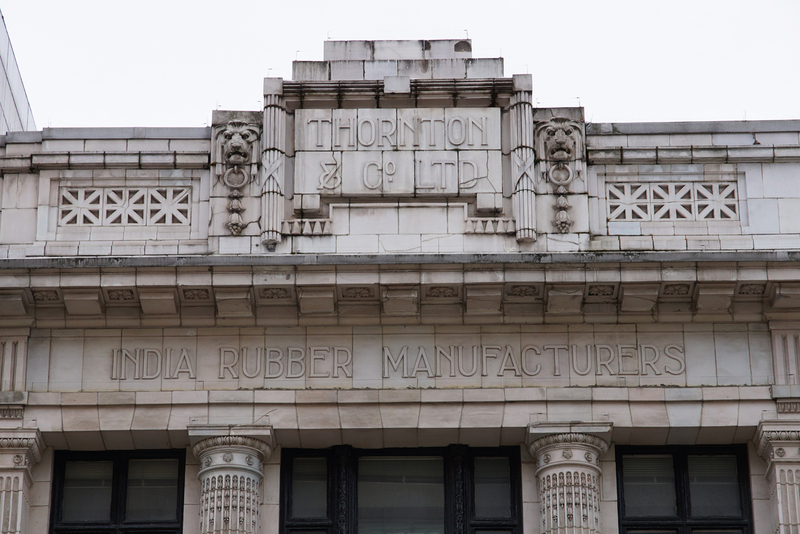 Thornton & Co sneak into the very end of the period, since their building wasn't completed until 1918. (I admit it, I'm cheating a little here!) 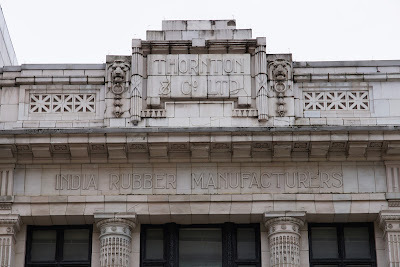 Their business as 'India Rubber Manufacturers' is redolent of the period (products included garments, rubber mats, air beds, industrial belts, and bottle seals), but the premises are notable for more than this inscription. They were built from state-of-the-art materials, including a steel frame and reinforced concrete, but what is really special is the cladding material. 'Burmantofts Marmo' was manufactured locally by the Leeds Fireclay Company, and was a matt-glazed faience designed to imitate marble. Produced from 1908, and designed to compete with Doulton Carraraware, it remained in production until the company closed in 1957. Finally, and back on Victorian ground, we have the extraordinary Time Ball Buildings. 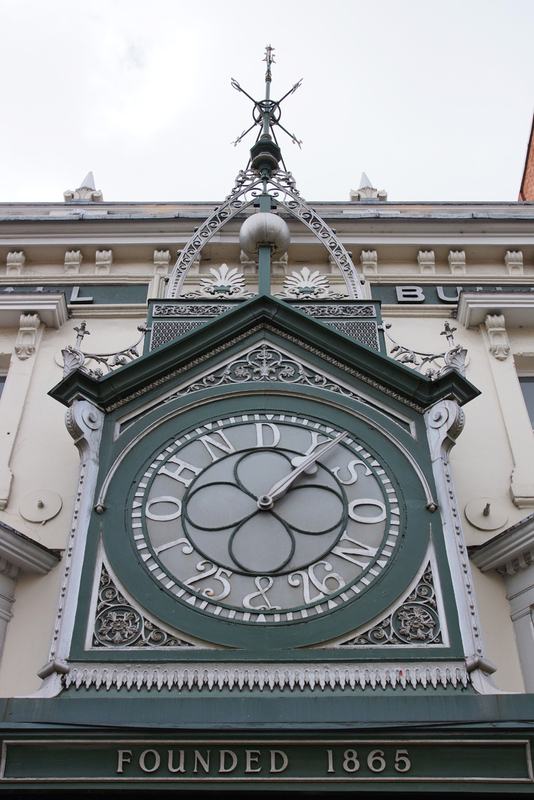 They were given their amazing facade by John Dyson, a watchmaker and clockmaker, in 1872. 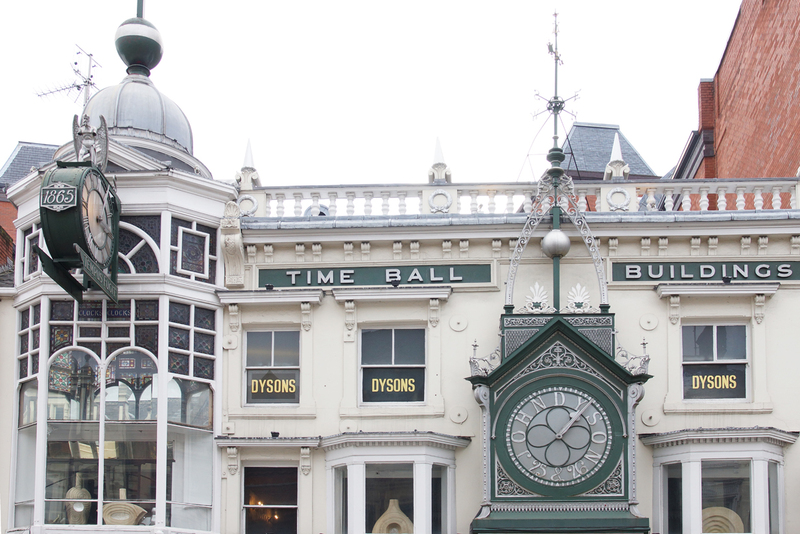 As the name suggests, it includes time balls which imitated their Greenwich counterpart by dropping at precisely 1pm each day. The time was communicated by telegraph from Greenwich to the railway station, and the information shared with clockmakers including Dyson. 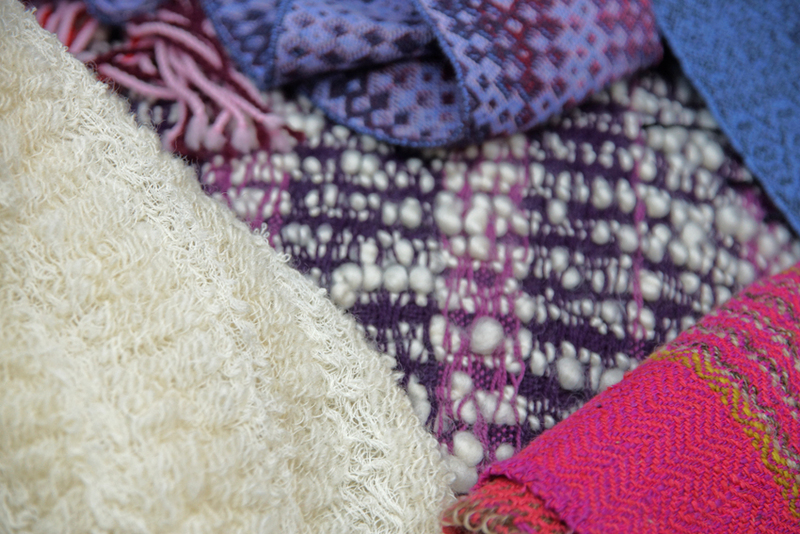 One tedious aspect of having a shop which sells small, valuable items is that they are very attractive to thieves. 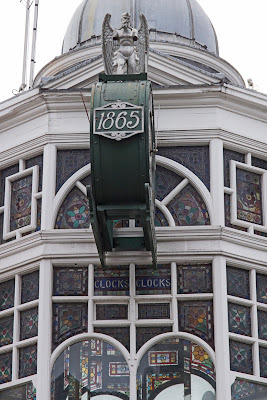 Thus watches have to be taken out of the window at night and placed securely inside the shop; then the whole process has to be reversed each morning. However, if you are an imaginative person with a clockmaker's skills, you might come up with an alternative system - and that's just what Dyson did. 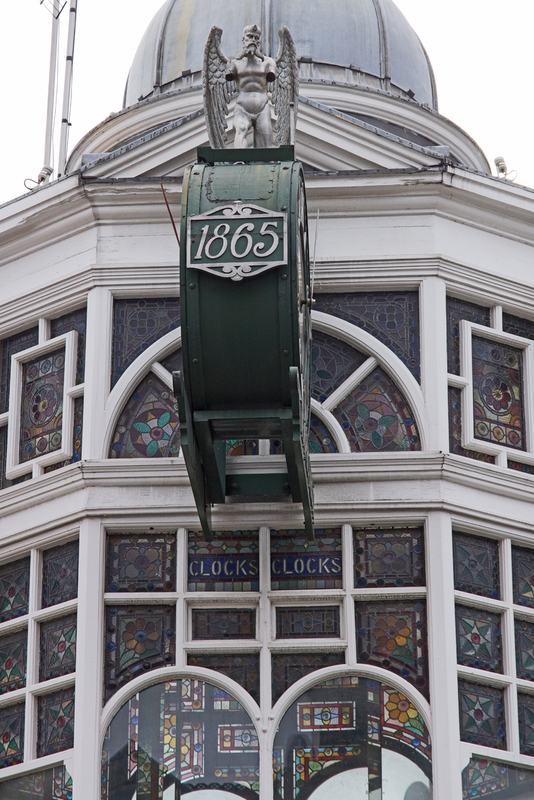 He installed a mechanism which allowed the entire window display to be lowered to safely each night and then lifted back into place during opening hours.